It's an experience many parents have had: From time to time my kids invite me to play video games with them. We pick a multiplayer game like MarioCart or Halo and they proceed to beat me silly. I keep trying to show moderately credible performance with little success. And I wonder, "How long would I need to play this game to achieve some degree of proficiency?" Part of the problem is that parents like me jump right into the multiplayer mode competing against our kids while simultaneously trying to learn the game mechanics. Most of these games have a single-player "campaign" mode. The campaign is designed both to be consistently entertaining and to step-by-step make you better at playing the game. The two primary rewards of the campaign are progressive discovery of the story (narrative) and progressive mastery of new skills. 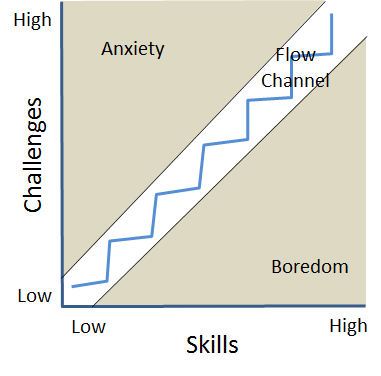 In his book, The Art of Game Design, Jesse Schell describes "flow", a concept he adopted from psychologist Mihalyi Csikszentmihalyi. 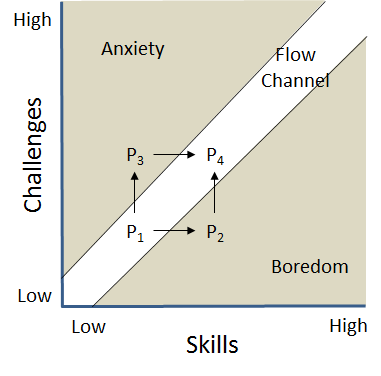 An individual is in a "flow state" when he or she is entirely involved in the task. "The rest of the world seems to fall away and we have no intrusive thoughts." It's a state of sustained focus and enjoyment. In figure 1 we see four player states on a graph of player skill vs game challenges. This can apply to a variety of games from physical sports to puzzles to first-person shooters. In this example a player is at state P1 where the player's skill is balanced with the challenge of playing. With practice, the player increases in skill and advances to state P2 in which the game becomes easy enough that the player is bored. P3 represents condition when the game is too difficult; perhaps the opponent is a lot more skilled or the game is too hard. In this case the player becomes anxious about their performance. Both states P2 and P3 can be rebalanced. The game can become more challenging (P2 to P4) or the player can gain skill (P3 to P4). But if the player remains in Anxiety or Boredom for very long they'll abandon the game because both anxiety and boredom lead to frustration. One goal of game design is to keep the player in the "flow channel." Here the player experiences the flow state continuously while both skill and difficulty gradually increase. But it's usually not a straight line centered in the flow channel. It's more a zig-zag with alternating rewards of easier wins and greater challenges. These match up to Dan Pink's "mastery" and "purpose" motivators. Russian psychologist Lev Vygotsky defined the Zone of Proximal Development (ZPD) as the area between the tasks that a learner can do unaided and the tasks a learner cannot do at all. So, tasks in the ZPD are those that the learner can do with assistance – with scaffolding. Vygotsky claims that all learning occurs within the ZPD. There are many ways to put this into practice. For example, the Lexile Framework and other text complexity measures allow the matching of reading materials to the student's reading ability. Texts that are close to students' abilities increase confidence while more challenging texts increase skill levels. Texts that are too easy (boring) or too hard (anxiety producing) can be avoided. Mathematics is a structured subject where concepts build upon each other. Therefore, concepts in a student's ZPD are those that build on concepts the student already understands. The Flow Channel offers a model to maximize player engagement and enjoyment. 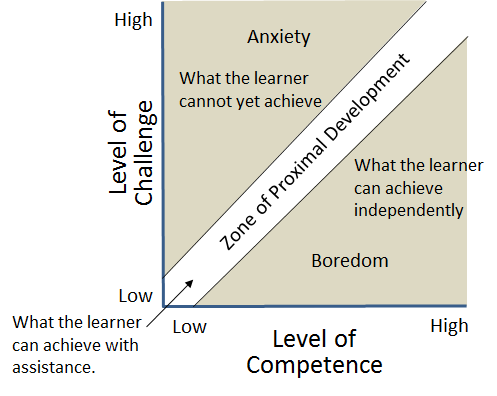 The Zone of Proximal Development is a model for optimizing learning productivity. Similarity between the two isn't surprising. Csikszentmihalyi studied and built on Vygotsky's work. One of the most important things that educators can learn from Flow is that boredom contributes just as much to frustration as anxiety does. Conventional schooling does a lot of redundant work to ensure that most students "get" each concept. The boredom that results from such redundancy means that students rarely experience Flow in their schoolwork. It's also inefficient because students spend a lot of time below their ZPD in which case they aren't learning. Staying within the Flow Channel/ZPD can ensure that effective learning occurs and simultaneously keep the student motivated and rewarded. It brings whole new meaning to, "Go with the Flow!" I love the whole concept of the zone of proximal development. Unfortunately, my kids at school and my husband at work seem to spend most of their time in the "bordom" area of the chart.